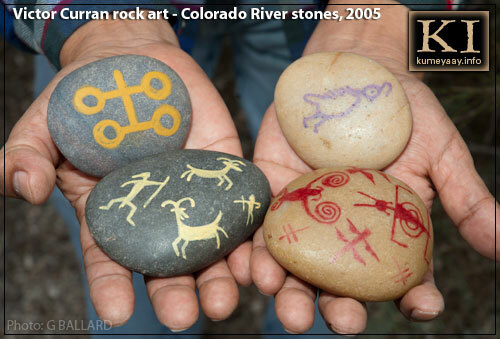 Quechan artist Victor Curran holds Colorado river snakes above, and Colorado river rocks he painted below. 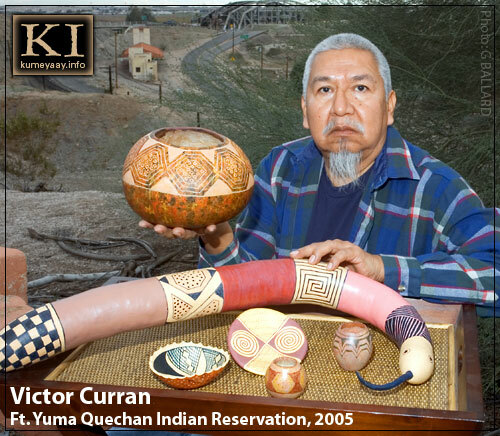 The Fort Yuma Quechan Indian Reservation has a history which dates back to the 1500’s. 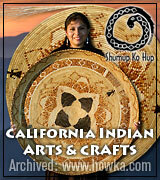 The Quechan Indian Reservation comprises over 40,000 acres along the California, Arizona, and Mexico border. 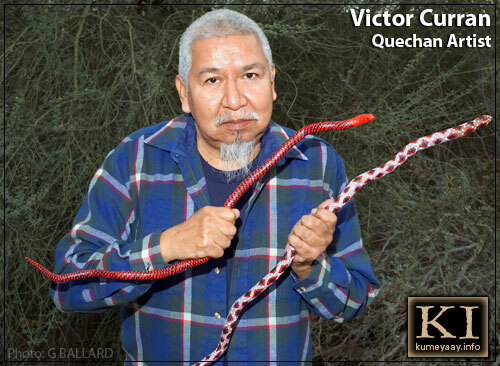 The Quechan Tribe is governed by a seven member tribal council, which includes a president and vice-president, and has over 3,000 enrolled Tribal members. 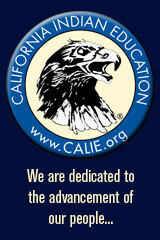 The tribe is a sovereign government, and as such, it has a unique government-to-government relationship with states and the Federal Government. This region provides a southwest desert and river environment spaciously unique in landscape and riparian life. 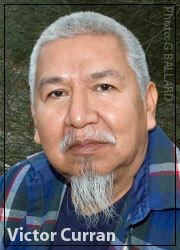 The Colorado River is part of our cosmology as to all river tribes. The river is vital to the agricultural development and as a water source to neighboring populations as it ends and is disbursed here trickling through Mexico into the Gulf of California. I developed my smaller works through conversations with various people who have keen interests in art history and current traditions. Assimilation has negative connotations as a divestment of ethnocentric and homogeneous values, merging into a dominant culture which aspires to a belief system of altruistic humanity. In the education process, social, economic, and political realities shape an individual for survival in a modern world, deemed however marginal. In examples of Art, this is either excellent or bad, my interests are only in making art, working out issues by the process of this contrivance, which takes on a diversity of formations. My recent series of smaller paintings developed out of cultivation in Southwestern Indian Archaeology, and are based on the slate palette of the Hohokam culture. The slate palette is a rectangular flat piece of slate rock. Its edges are abraded and incised with configurations of geometric crosshatching, notches, and figurative elements. The palette was a personal object which may have been handed down to individual family members. 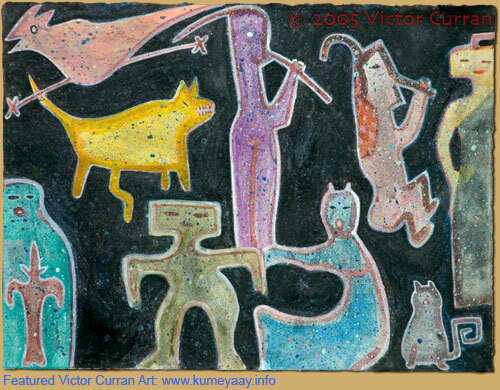 It was used in the preparation of mineral pigments for personal and body decoration or ceremonial use. 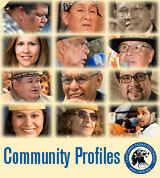 They were usually found in the cremated remains of excavated Hohokam sites. 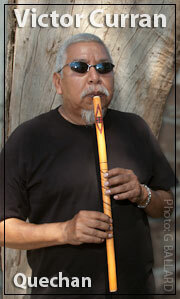 The Quechan still cremate in a traditional way with their personal belongings in a ceremonial manner. For me, it is in painting over older paintings recycling with a new layer of linear design and centered area for concentrated pigment or image, this experience of putting an abrasion on a stone palette, this application of painting encapsulated this moment. 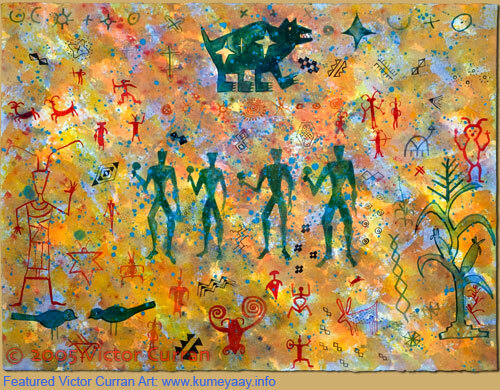 I have found useful and admirable the likes of the Hohokam and Mimbres cultures, pictographs and petroglyphs from the Pacific Northwest to the Baja Peninsula, art history contemporary art, and of course, my inescapable indigenous nature.